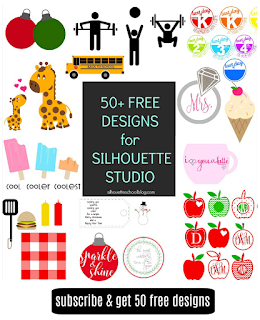 Making stickers with Silhouette is really no different than Silhouette print and cut...instead of printing and cutting on paper, you're printing and cutting on sticker sheets! And just like print and cut, once you make your first set of stickers, you'll be hooked!!! 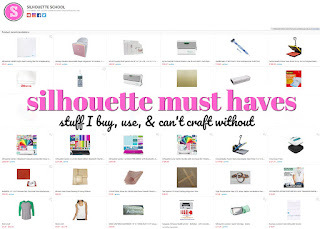 If you sell Silhouette items, it's a good reminder to let your customers know if you have hand wash only items. 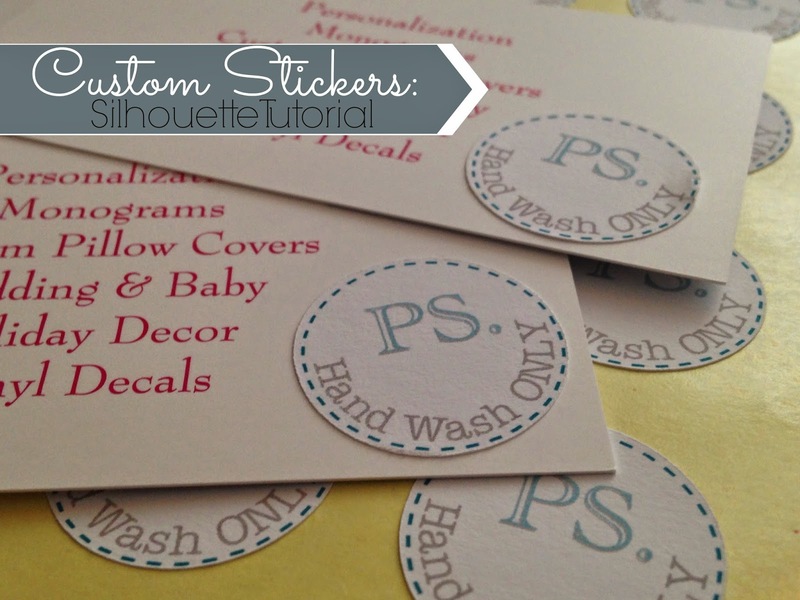 You can place these stickers right on your business cards and directly on the items. To start making stickers with Silhouette, you want to first create your sticker design in Silhouette Studio. 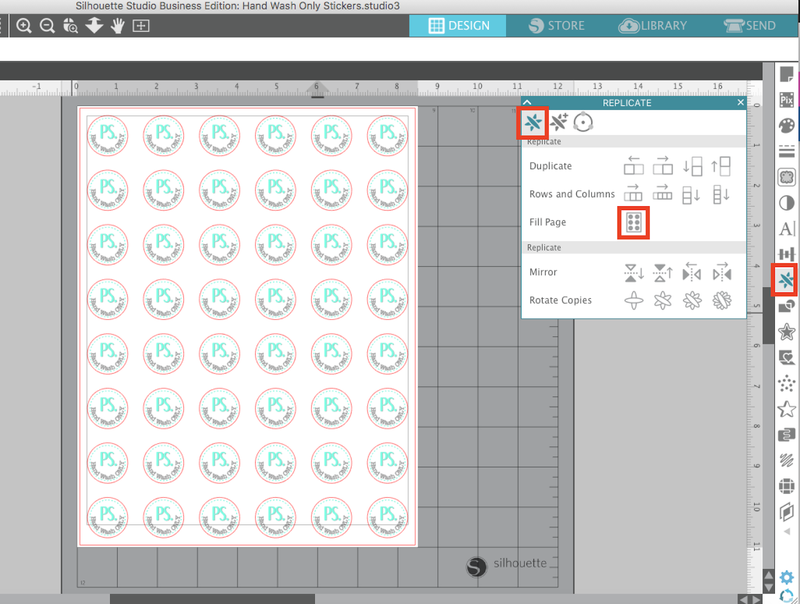 With your sticker design created in Silhouette Studio, now you can fill your page with it to make a full sheet of stickers. The next step is to add registration marks. This can be done by either clicking "M" on your keyboard or by going to the Registration Marks tab in the Page Setup panel. 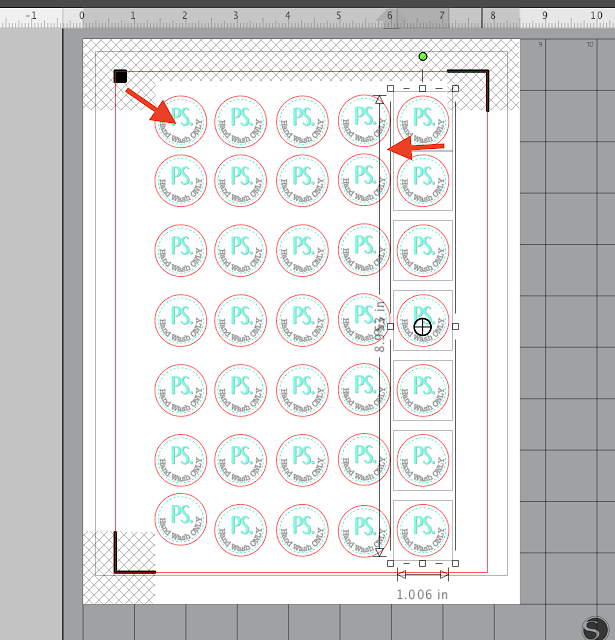 The Registration Marks will cover some of your stickers so be sure to delete any stickers that are outside the safe cut line and those touching the gridded area. Depending on the size and shape of your stickers you'll likely need to move your stickers around. Select all of the remaining stickers and move them into the safe print and cut area. Now you're ready to print to your home printer. I printed on the Silhouette brand White Silhouette Sticker, although my favorite sticker material is from Online Labels. After I printed, I prepared to cut. 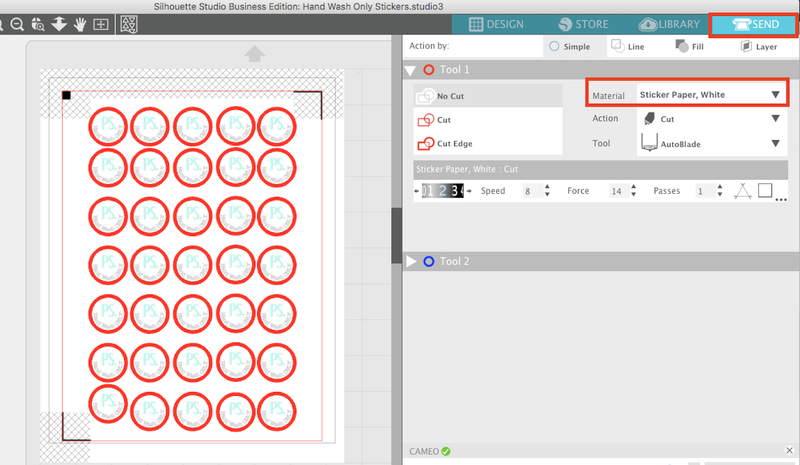 Return to Silhouette Studio and from the Send panel select Sticker Material, White. 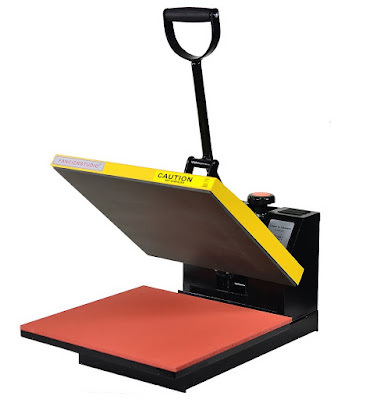 Place your printed sticker sheet on your Silhouette Cutting mat and load it into your cutting machine. I was cutting this set on my Silhouette Portrait, but the process is the same for Silhouette CAMEO as well. Just be sure you have the correct tool (Autoblade or Rachet blade) selected in the Send panel depending on the machine and blade you're cutting with. 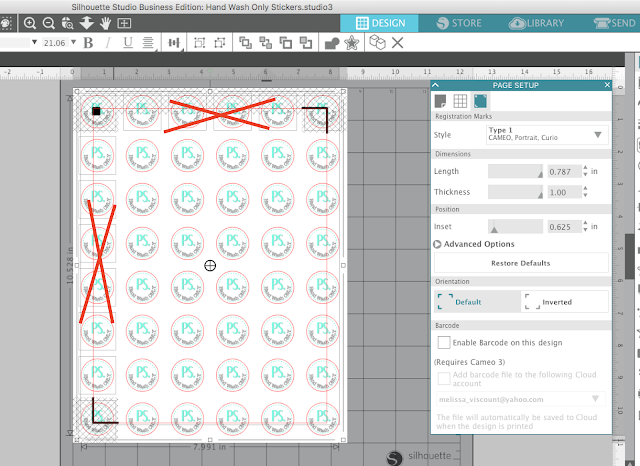 When you click "Send" in Silhouette Studio from the Send panel, the Silhouette mahcine will first search for the registration marks. That's how it knows exactly where to cut. Once the registration marks are successfully found, the cutting will begin. These stickers cut beautifully and only through the top sticker sheet - not the liner which is what we want. That's called a 'kiss cut' when the blade cuts through the top sheet, but not the bottom. Then just peel up the top sheet to 'weed' and you've got your DIY custom stickers made with Silhouette! how did you get your stickers printed on the sticker paper before you cut with cameo? sketch pins? Or did you design else where and print using your printer or what? Anything to help me figure this out Thanks in advance. It's essentially a print and cut...so I designed in Silhouette Studio, printed on the sticker paper and then cut on the machine. Please Help! This was so easy to do only thing is that when I print everything prints except the PS. I can't figure that out. If anyone can help please do and thank you kindly. Hi Niecy, It's most likely not printing b/c the text is not filled or the line does not have a weight to it. Change one or both of these and it should print. I'm wondering, one you design a sticker in the Sil project, is there a way to save the sticker only to your library so it can be used in other projects later? Similar to what you buy in the design store but it's your own design? I keep cutting all the way through the backing page. Any suggestions? I have the blade at 1 and the thickness at 15. Thanks!!! 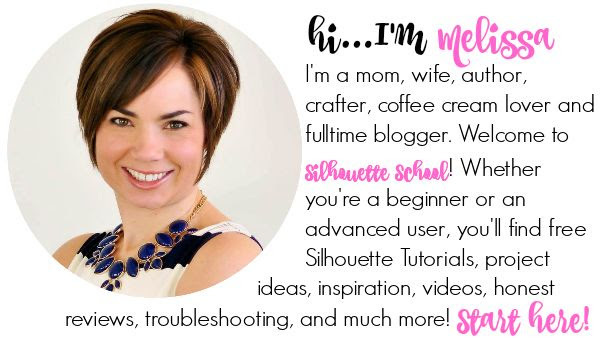 Thank you for your post, Do you have any tutorial video for use Silhouette ? 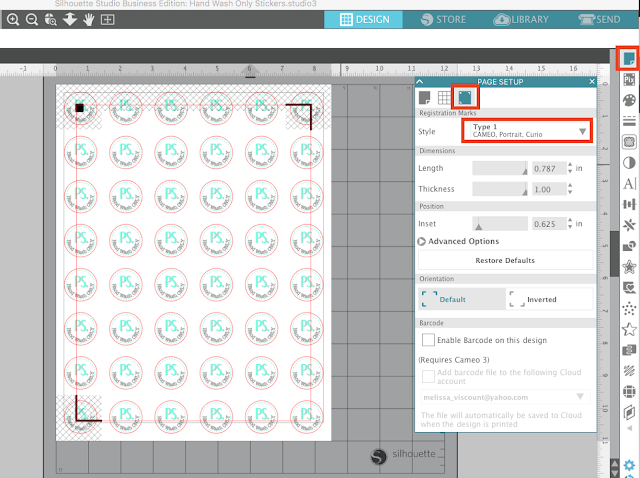 Ensure your entire design is grouped before you replicate. My problem is that I want to be able to remove the whole sticker sheet and not cut all the way through. 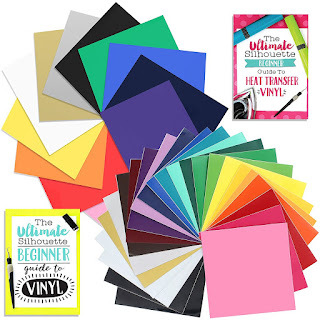 I want to create a sheet of stickers and peel them off of the sheet as I need them. Everytime I try to peel the sheet off of the mat, it takes a lot of force and ends up curling the sticker sheet no matter who careful I am. Are the mats usually this sticky? Any recommendations? I want to use the clear sticker paper to make jungle animal stickers for the walls and furniture of a baby's room. My question, is the stickers peel able so as the child ages you can remove them and perhaps put up some other type of decoration without ruining the walls or furniture? What kind of sticker paper? Sorry, I'm a newbie. Would window cling vinyl work well for glass items. I'm just concerned that sticker might not come off easily. 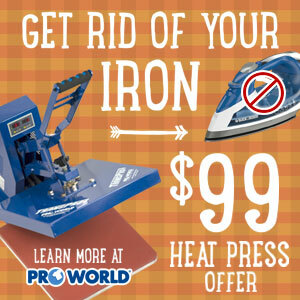 Do you use any kind of sealer to keep the ink from running off the sticker paper? Or is that more of a problem for glossy paper? Thanks! 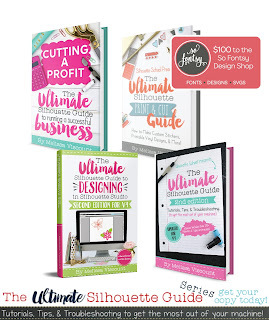 do you use a silhouette cutting mat? if so, which size do you use for the full size avery shipping labels? I made some stickers using the same sticker paper using the sticker cut setting, but with some stickers the blade cut through the top white sheet and bottom yellow sheet, other stickers it did not cut through at all. Any suggestions? I have the cameo 3 with the auto blade. Could the autoblade be part of the problem? Great idea.. Thanks for sharing this with us.. These tips and guides are really valuable. What kind of mat do you use? Do I need to have the PixScan mat to do this? 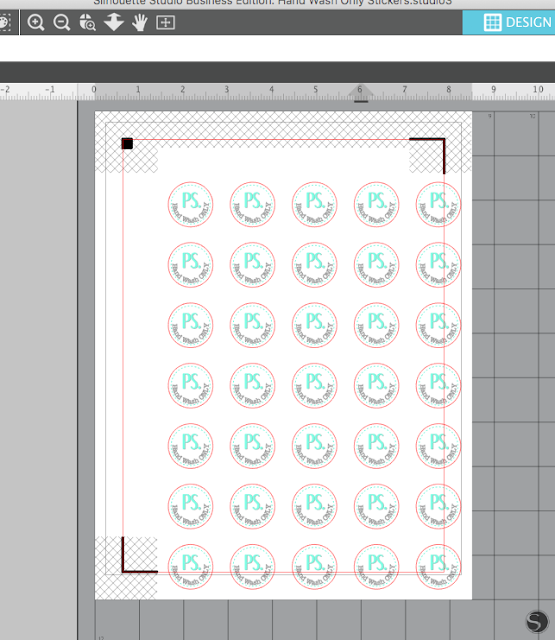 Is there a way to cut around each sticker so they could be individual stickers rather than one big sticker sheet?